AS YOU ENTER THE FRONT DOOR YOU WILL BE AMAZED BY ALL THIS HOUSE HAS TO OFFER. ON THE MAIN LEVEL YOU WILL FIND A LARGE GREAT ROOM COMPLETE WITH VAULTED CEILINGS, EXPOSED BEAMS & FIREPLACE. THE UPDATED EAT-IN KITCHEN IS PERFECT FOR ENTERTAINING AND FEATURES SS APPLIANCES. 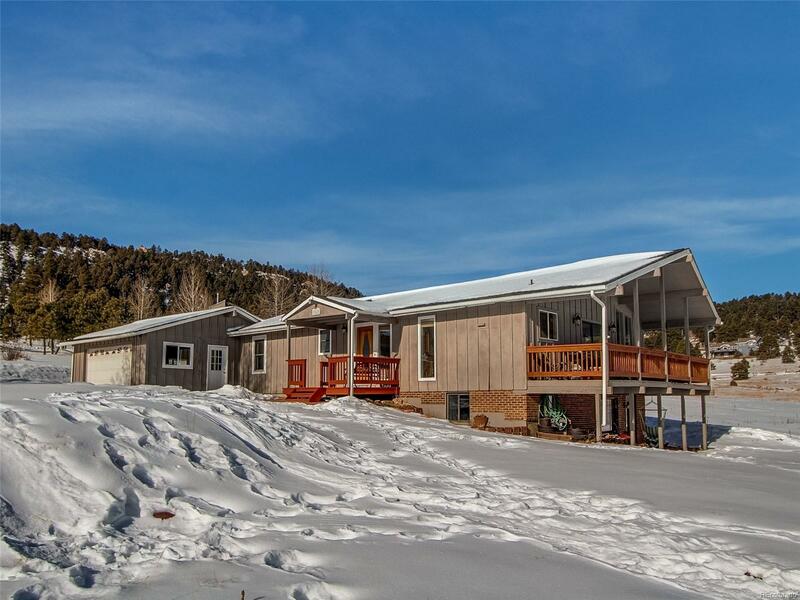 STEP OUTSIDE FROM THE LIVING ROOM ONTO THE COVERED DECK AND ENJOY THE MOUNTAIN AND VALLEY VIEWS. THE MAIN LEVEL ALSO INCLUDES 2 SECONDARY BEDROOMS, A FULL BATH, AND THE MASTER BEDROOM WITH PRIVATE MASTER BATH. VENTURING DOWNSTAIRS TO THE FINISHED WALKOUT BASEMENT YOU WILL FIND AN ADDITIONAL LIVING ROOM, 4TH BEDROOM W/ EN-SUITE BATH, & LAUNDRY ROOM. THE BASEMENT OFFERS PLENTY OF STORAGE SPACE AND A PRIVATE OUTDOOR PATIO. DONâT MISS THE ATTACHED 2 CAR GARAGE. PROPERTY IS LOCATED WITHIN WALKING DISTANCE OF THE NEIGHBORHOOD PRIVATE TENNIS COURTS, PRIVATE POND, AND CLUBHOUSE. UNOBSTRUCTED VIEWS IN ALL DIRECTIONS AND SO MUCH NATURAL LIGHT. CONVENIENTLY LOCATED WITH EASY ACCESS TO EVERGREEN, CONIFER, US285, C-470 AND I-70.